Car rental services refer to giving a car on rent for a particular period of time depending upon the customer requirement. The car rental services market includes the service provider (who gives car on rents) and the consumer (who takes car on rent). Both these entities connect through either online or offline platform. The target market of care rental service providers comprise business travellers, tourist and other travellers. Car pooling and car sharing has led to explosive growth of the car rental industry. In terms of revenue, global car rental market was valued at US$ 98,100.00 million in 2016 and is estimated to be worth US $197,020.00 million by 2027 with a CAGR of 6.6% over the forecast period. With massive funds committed to the development of mobile applications and advancements in IT infrastructure, online bookings for car rentals have increased worldwide. New business models in the recent era have made it very easy for companies to speed into the car rentals market. Increased income levels across the world has resulted in a thriving tourism industry and better road infrastructure. 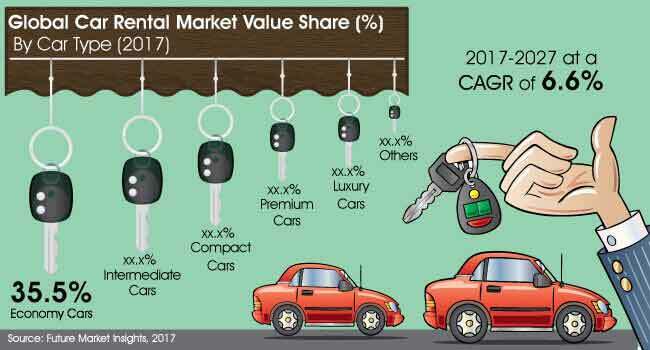 Strong GDP growth of countries has also propelled the growth of car rental market. Economy cars contributed a significant share of revenue in 2016, and this trend is anticipated to continue for some time. Economy cars are typically used by car poolers and intercity travellers. However, service providers offer a variety of cars for hire to consumers. The car selection entirely depends on customer requirement and budget. Economy cars accounted for 35.78% of the total revenue generated in 2016, i.e. a value of US$ 35,100.71 million. This is attributed to increased economic activities and requirement of business travel around the world. Even with the proliferation of smartphones and the increased acceptance of online channels, offline booking emerged to be the higher revenue generator. Offline booking segments is estimated to account for approximately 45.74% market valued at US $ 44,871.63 million in 2016. Nonetheless, it is only a question of when and not if online channels will outpace their offline counterparts in the car rental market. By sector type, the market for Car Rental Services is segmented into Organized and Unorganized sectors. Organized sector segments is estimated to account for approximately 57.69% market valued at US $ 56,590.18 million in 2016 and should rise to a value of US $ 120,430.33 million by 2027. On the basis of booking type, global car rental services is segmented into intercity, intracity, on-airport, and others. With air travel showing no signs of slowing down, airport transportation segment accounted for 36.03% of the total market in 2016. Increasing air trips for both business and leisure purpose is fuelling the growth of car rentals to airports. Geographically, Asia pacific is predicted to be the car rental service market to look out for, flying high on the robust economies of India and China. On the basis of customer type, global Car Rental Services is segmented into business class and leisure class customers. The green revolution and emerging business channels should play a major role in the car rental services market. Business class customer type segment is assessed to account for a market value of US$ 49,955.84 million in 2016. The North America market has been estimated to outpace all other regions in the Car Rental Services market, accounting for maximum revenue share of the market by 2017 end. Collectively, North America and Western Europe markets are on track to account for 57.16% revenue share of the global Car Rental Services market by 2027 end. APEJ is estimated to exhibit a significant CAGR of 9.1% over the forecast period. Future Market Insights (FMI) offers a 10-year forecast of the global car rental services market between 2012 and 2027 in its report titled ‘Car Rental Services Market: Global Industry Analysis (2012 – 2016) and Opportunity Assessment (2017–2027)’. The current study reveals the market trends and market dynamics in all seven regions that are expected to positively affect the current market environment and future scenario of the Car Rental Services market over the forecast period. This Future Market Insights report inspects the Car Rental Services market for the period 2012–2027. The prime objective of this report is to offer insights into developments in the car rental services market that are gradually helping transform global businesses associated with the car rental services market. The global car rental services market report begins with the executive summary and defines various categories and their share in the Car Rental Services market. The section is followed by market dynamics, an overview of the global car rental services market that includes FMI analysis of market drivers, restraints, opportunities and trends that are impacting growth in the car rental services market. Furthermore, the attractiveness index with elaborated insights is provided that perfectly encapsulates the market attractiveness based on metrics such as CAGR and incremental opportunity. The car rental services market is segmented on the basis of car type, booking type, customer type, sector type, end-use and region. On the basis of car type, the market is segmented into economy cars, compact cars, intermediate cars, premium cars, luxury cars, and others. On the basis of booking type, the global car rental services is segmented into Offline Access, Mobile Application, and other Internet Access. By sector type, the market for car rental services is segmented into Organized and Unorganized sectors. On the basis of customer type, global car rental services market is segmented into business class and leisure class customers. On the basis of booking type, global car rental services is segmented into Intercity, Intracity, On-Airport, and others. Competition analysis is critical in the global car rental market and the FMI report has delivered on that front. The report has profiled some of the most prominent companies actively involved in the car rental market and readers are advised to refer to this informative section. The competition dashboard comprises a broad organizational overview, financial ratios, strategies adopted, and recent company developments that affect their position in the car rental market. The research methodology developed by Future Market Insights is envied by our competitors and trusted by our valued partners. Our team of expert analysts begin their study with exhaustive primary and secondary research by conducting interviews with key stakeholders, industry and domain experts. The data is then thoroughly scrutinized with the help of advanced company tools to extract all the necessary qualitative and quantitative insights pertaining to the global car rental market. 18.3.9. Avis Budget Group Inc.
18.3.10. Carzonrent India Pvt Ltd.